Chlorine was first added to drinking water in 1908, helping to eliminate waterborne diseases in the U.S. One effect of processed and treated municipal water is that well-used kettles frequently grow deposits inside. Most kettle deposits are an accumulation of calcium and magnesium in chlorinated water. These deposits should be removed periodically as you notice the build-up. 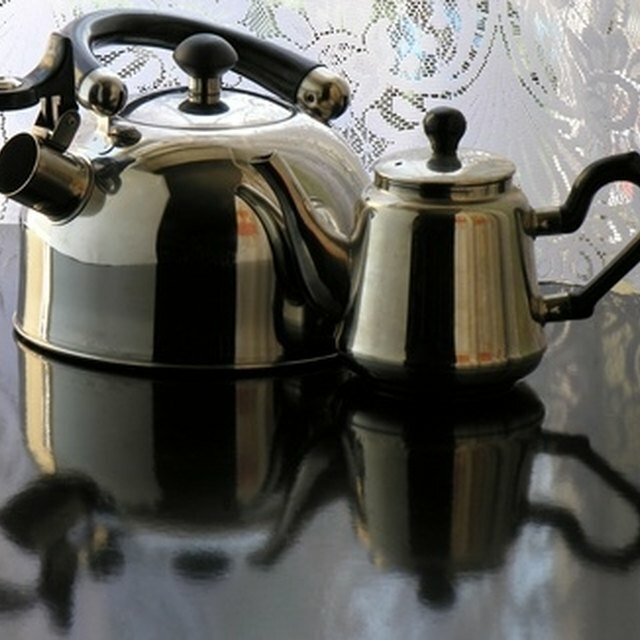 Most of the time, kettles with mineral deposits are salvageable, but if there are significant deposits and wear from chlorinated water, the kettle should be replaced. Clean your kettle with vinegar. Add pure white vinegar to the kettle until it's about 1/3 full. Bring the vinegar to a boil for five minutes and then remove from the heat. Drain the kettle while it's hot and allow it to cool for a few minutes. Wipe the inside of the kettle with a dishcloth. The remains of the deposit should wipe right out. Rinse the kettle with water several times. For mild deposits, add a solution of vinegar or lemon juice diluted with water to the kettle and let it sit for several hours. Avoid breathing in the vinegar steam.